Hot Joint, smooth video. The fellas are rockin their gear and the girls are too fly in this one! Check out The Louis gear, Luda's watch and the way Juelz, Luda, and Fab kill it! ZShock is happy to announce that ZShock's iced out Baby-G's have dropped. The first of two immediate collections is live at www.ZShock.com and available to order. The Fassionalle Collection comes in a few color combinations but all have the summer's hot pink face. ZShock's iced out diamond baby-G collection is for the energetic, funky and hip female that loves to sport her Baby-G with an added layer of elegance. Zshocks are being seen on the wrist of real life ballers and fellas that can wear just about anything they want. Watch this video where will see NFL wide receiver O.J. McDuffie shouting out ZShock and showing off the iced out G-Shock by ZShock. Aaron Reid, seen here with JoJo Simmons, Jason Johnson and James Smith is rocking his diamond GShock with the ZShock Premier Genesis bezel. This shot was taken at the YEEC event in Atlanta. James Smith, Jason Johnson, and Aaron Reid founding members of The Young Entrepreneur Empowerment Coalition a.k.a. YEEC. You can check out their great initiative at www.YEEC.org. ZShock wishes the YEEC movement nothing buit the best in their endeavors. ZShocked watches are poppin up everywhere. 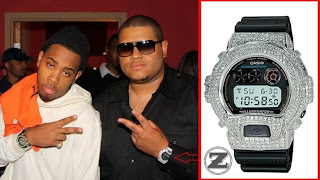 For those who don't know, a ZShock watch is an iced out Diamond G-Shock by ZShock. NFL running back, Terry Kirby is spotted wearing a Zshock and commenting on the diamond watch. The watch Terry is wearing in this video is the Mogul Prep Zshock. Watch this video and see why real ballers keep an iced out G-Shock in their collection, just for the fun of it.